On the run, Han, Leia, Luke, R2 and C-3PO are looking for a way to reconnect with the Rebellion. With some help from Sana Starros and some other Rebel sympathizers, they get their intel only to wind up on some strange planet in order to hide from the Empire. As far as side stories go, this one is about as disconnected from main films as can be. Everything starts out in a bar with them hiding under a table from some snooping stormtroopers. They get their intel, but have to take a circuitous route to get to their destination, only to get side tracked by an unexpected Imperial ship. Here’s the thing. They are supposedly paying Sana to smuggle them to their destination, but she doesn’t seem like she’s very good at it. No one is hiding in secret compartment to evade detection. No one has alternate identities or disguises. On top of all of that, in order to evade the Empire, Han has to come up with an idea, which is to have her drop them off on some planet called Hubin. The problem with all of this is that Sana, once again, gets thrown in the mud. It seems like no one knows how to write her character. Whenever there is an opportunity to do something with her, she’s just an imitation of Lando and Han, a merc/smuggler looking for credits who just happens to be helping the bad guys. They never do anything to build her character, make her truly unique and worthwhile. When you could remove her character and not affect the story, it makes you wonder what her purpose is. Regardless, the characters wind up on this weird planet. It’s dark, and the coloring of the panels is very grayish, yet Luke still remarks about how green everything is. Then they get chased by a large, nasty looking bear thing. Oddly, Luke doesn’t seem to have his lightsaber, which should have made quick work of the creature. They get saved by the locals, and a droid makes Han a drink, which wraps up the issue. It’s a story that seems flawed in spots, lacking in any real merit, and just a holding position for something that really matters. On the plus side, there’s some good artwork in this issue. 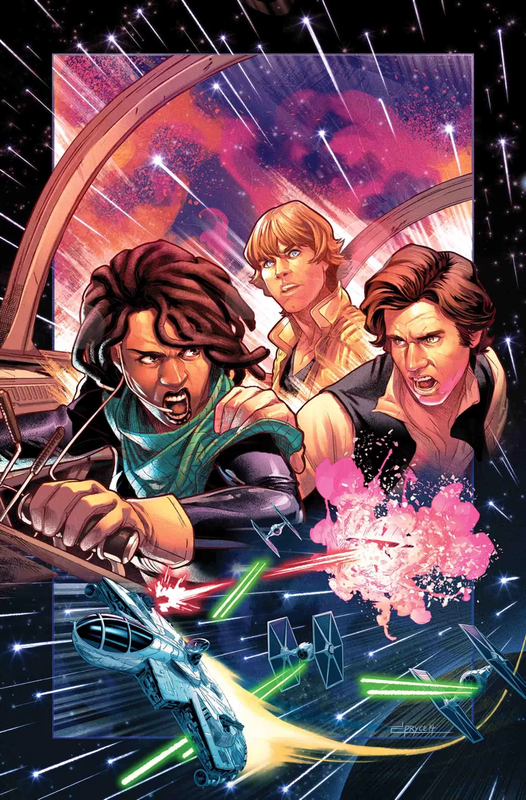 There are a few panels, specifically a few shots of Han’s face, that look odd and off putting, but otherwise there’s a lot of great looking panels. The coloring is good, and there’s lots of detail. With a weak story and strong visuals, it’s an okay issue. There’s not much to get excited over, and to be honest, I’m not looking forward to the next issue. Hopefully something happens to make things interesting again. As is, I give it a two out of five metal bikinis.